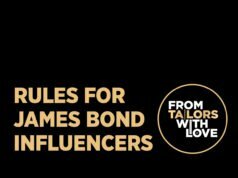 In this bonus episode of From Tailors with Love, I discuss my visit to Spyscape and James Bond clothiers Turnbull & Asser, N.Peal and Tom Ford on a fantastic day organised by The Bond Experience. You can read more about it in my earlier blog. You can download the podcast from iTunes or Stitcher, or you can listen at the top of the page. You can also watch us discuss the Spyscape event (with a few clips from Spyscape) on YouTube below, where you can see me wearing my beautiful gifts from N.Peal and Tom Ford. 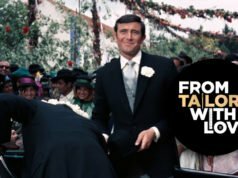 Please subscribe to The Suits of James Bond YouTube channel! The bit about T&A coming around with their Bond association is interesting. They used to be much more discreet about their association, and at times a bit snooty with Bond fans, particularly at their UK location (ask some folks at ajb007 about their circa 2000 experiences). Along with their increased online presence (social media, online sales), they seem to have decided the Bond association is a good thing. 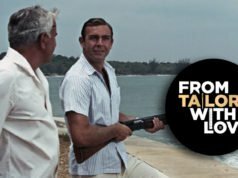 I also think some of the younger Bond fans who grew up watching Brosnan and knowing of the T&A link are coming of age so to speak, and now have the disposable income to afford $500 bespoke shirts lol. So they are wise to make those fans feel like welcome customers. I noticed a similar thing when I visited Portmierion, Wales – the unique town that “The Prisoner” was filmed in. When I was first there in the 1980s, the locals, while sort of polite, also essentially greeted us fans with eyerolls and shrugged shoulders. I was back again in September and I noticed everything had changed. Prisoner fans were actively welcomed. They had even built a monument to Patrick McGoohan. The head of Public Programs, who was giving a tour, told me that the staff were amazed that a 17 episode spy show from 50 years ago is now, whether they liked and understood it or not, what the town was going to be known for.